The jay is a lover of acorns, perhaps one of the reasons why there are so many in our quiet valley. A beautiful blush colour, we see them rarely but when we do it is the spot of white on its rump and the flash of blue on its wing which enable easy identification. A member of the crow family, the jay is resident in Spain and – though it is shy and rarely approaches the house – we are always aware of its presence thanks to its distinctive alarm call. 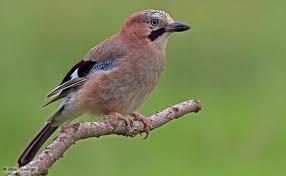 To listen to a jay’s birdsong, click this link for the British Birdsongs website. To read more about the jay, click here for the RSPB. This entry was posted in Nature and tagged Andalucia, birds, living abroad, nature, Sandra Danby, Spain on September 1, 2015 by sandradan1.